Finally we have a male calf too- Baronin pp got the first Sirius progeny in Styria . With a birth weight of 55 kg Seyffenstein was quite big compared to our other calves. 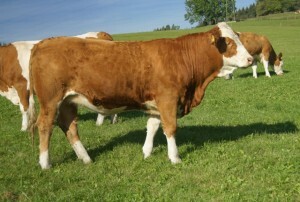 But this is rather to his advantage, cause he is already confronted with 4 female calves. Until now it seems he is polled- so living with a lot of girls is the best preparation for his future life as herd sire!